Some childhood gaps are welcome news, like that gap-tooth smile. Achievement gaps? Not so much. Are achievement gaps getting better or worse? Why are proficiency rates a clumsy measure? Which student subgroups tend to score highest and lowest? How can schools reduce achievement gaps? How are achievement gaps measured? California's student body is officially organized into groups by grade level, but it can also be seen as consisting of "subgroups" based on race, economic wellbeing, English language readiness and gender. Frustratingly stable patterns predict which subgroups of students tend to do better in school and which tend to do worse. These measurable differences, known as "achievement gaps," are usually quantified using standardized test scores. Gaps in students' academic readiness can also be measured in other ways, such as graduation rates, college-going rates and course grades, but in the education system, test scores are the currency of the realm. There are some good reasons to measure achievement gaps using standardized test scores. They are widely used and understood. They can reveal small differences or trends. They are comparatively quick and inexpensive. They also seem to correlate powerfully with less convenient measures. Students with higher scores are more likely to persist in school, graduate, go to college and succeed there. Poverty strongly correlates with test scores. Students who qualify for free or reduced-price lunch service (a common measure of poverty) tend to score lower on tests than the kids who don’t. Race correlates, too: on average, black and Latino students tend to score lower on standardized tests than white and Asian students do. Describing patterns of difference turns out to be more difficult than it might seem, even using test scores. After a student takes a standardized test like the CAASPP, California's state tests, a complex process grades the test using a "scaled score". It's more than just a simple measurement of the number of questions that you get right or wrong. Some questions are harder than others, so they are worth more than easier ones. Some questions are literally worth nothing because they are experimental. A test score without context is meaningless, so test designers identify performance tiers, assigning cut-points that indicate whether students have met expectations. California's system separates scores into four tiers. Let's suppose that you and your twin sister each take a test, say the grade 5 CAASPP test in mathematics. Your sister scores 2,527 scaled points. You score 2,528—one point higher. Your parents receive two envelopes in the mail with the score reports. Tearing open the first envelope, with warmth in their heart they learn that your score indicates "Standard Met." They open your sister's envelope, and the warmth fades. Alas, your sister's score falls short. It lands in the "Standard Nearly Met" range. Of course, the one-point "gap" between these hypothetical scores is insignificant from a statistical perspective. If you both retook the test, your scores would probably be similar but not the same. Like free throws in basketball, there's skill involved, but a bit of randomness, too. Randomness becomes less important when small samples like this are combined in larger numbers. The close calls on either side of the line tend to cancel one another out. Unhappily, the statistics show that there are some big gaps. How Big are the Gaps? Starting in 2002, the CST showed rising scores for 10 years, for all groups. Yes. Over time, the long-term trajectory of California students' scores on standardized tests has been upward. Slowly but significantly, annual successions of students at each grade level are out-scoring their predecessors. Scores on the CAASPP tests have risen modestly, but the tests have only been around for a few years. It's easier to see the long-term trend by looking at the test results on the "CST" tests that preceded it. For all subgroups, scores rose for ten years. Yes. According to California's state tests, scores have been rising over time for all groups of students. The improvement is corroborated by rising graduation rates. The federal NAEP test shows long-term improvement, too. Are scores rising in a way that reduces achievement gaps? Perhaps not—or at least not lately. According to the Public Policy Institute of California, "achievement gaps persist and have widened in some cases." What can be done about it? EdSource launched an online conversation about it in 2015, inviting views about what should be changed. Spoiler alert: it does't seem there's a ready supply of easy answers. When looking at any chart that compares "proficiency" rates, squint a little. Remember, individual scores are pesky, detailed things. A little bump can push a score over the cutoff line between one achievement category and the next. Cutoff points are defined by fiat—they are supposed to represent a standard of achievement, not a relative position within a curve. By the nature of statistics, if a cut-off point stays put while a curve moves, metrics that describe how much of the curve falls above or below the cut-off point will highlight the significance of some changes while understating others. If the cut point is anywhere close to the steep part of the curve, a little bit of change can cast an exaggerated shadow. Education statistics are loaded with metrics derived from cut-off scores. Bell curves have two tails, and some critics argue that reducing gaps by boosting the learning of kids at the bottom of the learning curve isn't enough. They argue that long-term American competitiveness requires that a school’s mission, should include focus on gifted kids at the top of the curve, too. The success of California’s schools, districts, and public education system as a whole are often judged by how effectively they address these predictable gaps in achievement. The next lesson discusses the ways these systems’ successes are measured. About half of California's students are socioeconomically disadvantaged. About half are learning English. On standardized tests, what happened to the test scores of these categories of students in the ten years beginning in 2002? I believe the districts could use this information and data and allocate additional resources to schools in attempt to reduce this gap, and that would also result in test scores increasing. That's one of the intentions of the Local Control Funding Formula introduced in 2013! (See Lesson 8.5) Districts get a base amount of money per student, plus 20% more for students with need (English learners, those in poverty or foster care) up to 55% of the district, and 50% more money above the base for students in need above 55% (to address the concentrated poverty.) 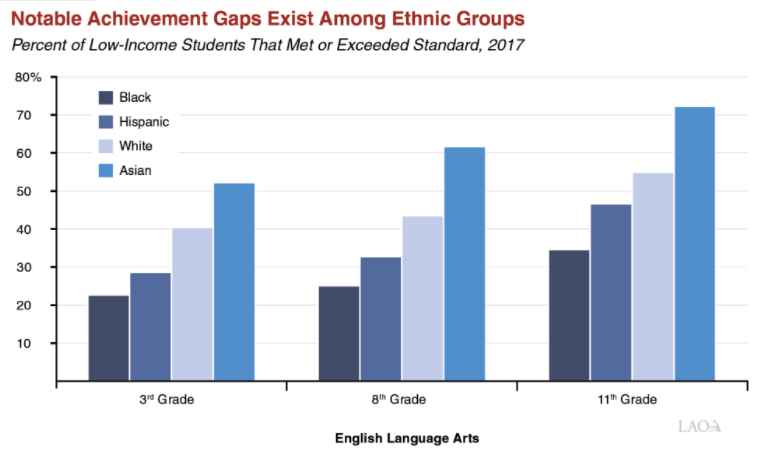 Assigning the money by race would be illegal, but the achievement gaps based on poverty and English language learner status correlate well with the racial achievement gaps. We'll see how it works going forward. I am not a fan of these standardized test. From what I can tell from the article (and please correct me if this is incorrect) these standardized test seem only to tell us that their is a gap, but tells us NOTHING about how to fix it! Why should students continue to take these test, that cause tons of stress and force teachers to spend the entire year preparing their students for one test to maintain funding, if all they are going to do is tell us that their is a problem that we now know about? Although standardized test scores are are difficult way to measure students academic skills because all student social tests differently, the test scores relating to race and poverty make sense to me because of their access to resources that will benefit their education. Thankfully the scores are raising, but ideally we'd like the patterns to change based on the correlations between race, poverty and scores. Would getting rid of standardized tests help? Achievement gaps divide and society loses a lot of potential talent in the process. Something needs to be changed. I wish there was an easy way to close this gap. I dont know why race is a factor in this. Many of the charts focus on race rather than economic status, which I feel has a huge impact on the achievement gap. People with lower income often have less opportunities. Although I think all kids should receive fair chances to succeed, I believe there will always be an achievement gap because of the competitiveness installed in these children. 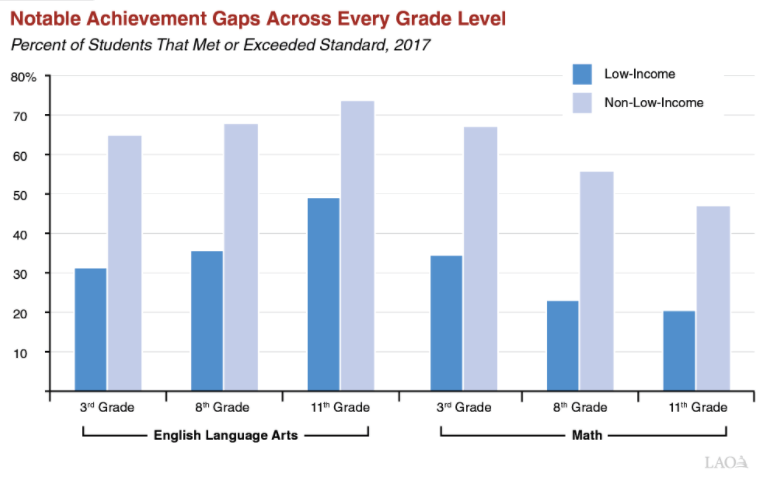 If we help raise the scores of those who did not meet the standard, the kids who did meet the standard with also improve, leading to the same achievement gap and same gap in standardized test scores. I believe there are more factors that come with achievement gaps. I think teachers can be a big part of the problem. Let’s say a kid gets a unmotivated, lazy, and terrible teacher at a young age such as in 2nd grade. That teacher may affect the kids outlook on school and how much effort he puts into school the rest of his education. I agree some teachers and some students are not motivated. We need better programs to help kids do their best in school. Some children learn differently than others and we need to do our best to figure out how to accommodate for all the different ways of learning. Some kids also require more help or are slower learners. A majority of people are able to learn material, but the way teachers go about teaching it does not work for everyone, thus negatively impacting the child's testing and material actually learned and absorbed. There is a gap between the groups of races because of the poverty and money differences among them and their classes. While test cries have significantly risen throughout the years, the gaps between all the races are still very prevelant. At the risk of making some people upset, I think the achievement gap exists because there are teachers who are unable to teach. This situation exists in affluent as well as in areas of poverty. If it weren't true, than why do we have 40 million Americans who can't read beyond a 3rd grade reading level? Reducing the achievement gap is an important goal. But it isn't something that can or should be required of school districts. The achievement gap is a result of poverty and the environment in which a student lives - only a very small part of which is influenced by the school they attend. Reducing the achievement gap requires funds for housing, healthcare, good paying jobs for parents, perhaps substance abuse treatment for parents, etc, etc. Schools have funding for NONE of this. Schools aren't even adequately funded to educate the most well off students. Many schools have no librarian, music, art, books or even paper unless the parents pay for it. An important provision of No Child Left Behind (NCLB) requires that each student be tested each year. Part of the motivation for this policy was to force schools and districts to notice patterns - achievement gaps - in the groups and subgroups of students that fall behind. (Presumably, noticing the gaps would help them to do something about them for the following year's students). One of the biggest challenges is measuring achievement in students with severe disabilities. Even with the CAPA, it's hard to measure progress in students who remain at the lowest test level year after year. Some studies in lottery-based charters like KIPP might enlighten us all after ten or twelve years of developmental studies. I gather validity is about random samples and true experiments, but control groups are not usually ethical.